Isis Goddess once more set out on a search for her husband’s body, but this time she had to find its parts. Attended by birds and beasts, she sailed up and down the Nile in a frail boat of papyrus reeds lashed together. The dreaded crocodile avoided the boat and refused to harm its divine passenger, thus originating the belief that the crocodile will not attack anybody floating in a papyrus boat. One by one Isis Goddess found the dismembered parts of Osiris God. Wherever she found one, she pretended to bury it and to build a shrine marking the spot. Actually, according to Diodorus, Isis Goddess made a waxen mold of each part, presented it to local priests and made them swear to protect forever this “part” of the god’s body. 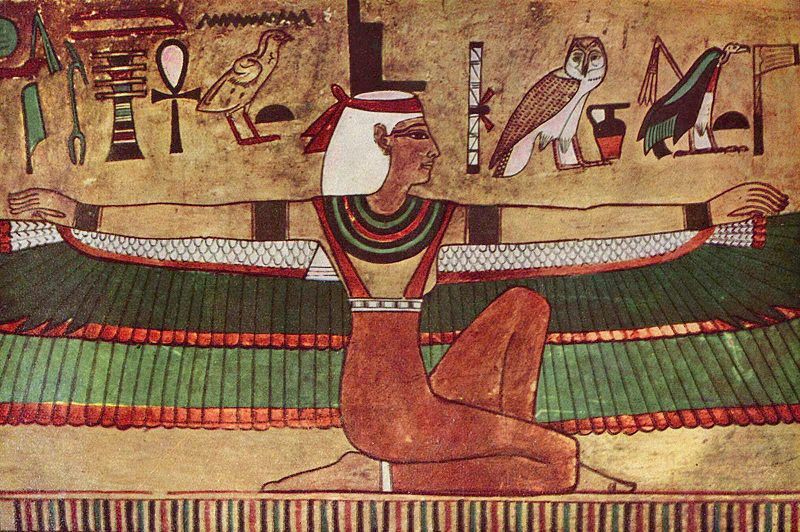 In return she promised each priest the personal use of one third of the land set aside for the worship of Osiris God . The historian explained the result: “accordingly it is said that the priests, mindful of the benefits of Osiris God, desirous of gratifying the queen, and moved by the prospect of gain, carried out all the instructions of Isis Goddess . 'While some believed that she actually buried the god’s parts ]n these shrines and tombs, most accepted the idea that this was Part of an elaborate ruse to trick Seth, and that she took the real Parts of Osiris God' body to Horus in order that he might put them together again. It seems that she found all but one of the parts: the god’s sexual organ, which had been eaten by fish the lepid, tus, phagrus, and oxyrhynchus. Unable to reassemble the body completely, Isis Goddess made a mold of the missing part and, according to Plutarch, “instituted a solemn festival to its memory, which is even to this day observed by the Egyptians.” Unfortunately for the curious, this festival seems not to have survived Plutarch’s day. Isis Goddess’ trick of pretending to bury the body wherever she found a part helps to explain why there are so many shrines to Osiris God. Each site jealously guarded its claim to have responsibility for protecting the god, and before many centuries had passed, new sites arose claiming to be authentic as well. As Isis Goddess delivered the parts of Osiris God’ body, Horus-with the assistance of Anubis and Thoth-set about reassembling it. Once it was all together, except of course the part eaten by the fish, the body was wrapped in white linen and placed in state at the Temple of Abydos. After Horus had fought his battle with Seth, he returned to Abydos with the eye he had won from his evil uncle. Osiris God sat on a throne with his arms crossed holding the flail and scepter. Horus reverently opened his father’s mouth and allowed him to eat of the eye, which gave him eternal life (the mythic origin of the ritual of the Opening of the Mouth). Horus then put into place a long ladder that stretched from Abydos to heaven, and slowly Osiris God climbed upward, accompanied by Isis Goddess and Nephthys wearing beautiful robes. Thoth followed carrying the book of the gods, and Horus helped his father climb whenever he needed slight assistance. 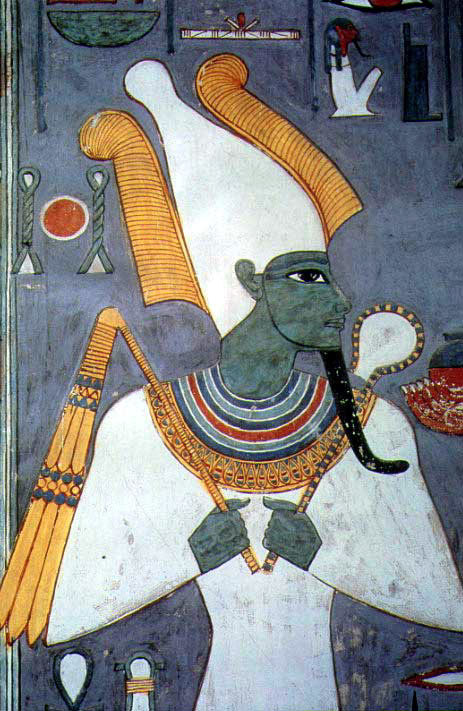 As he climbed higher, Osiris God was able to see the mountains to the east and west and feel the cool breezes from the four corners of the earth. The solar boat lighted his passage and finally he stepped out onto the crystal floor of heaven, which rested on the peaks of two mountains. Now an immortal, it became his task to judge the lives of the mortals who sought to follow him.